Read An Excerpt From "The Distracted Mind"
We all do it. 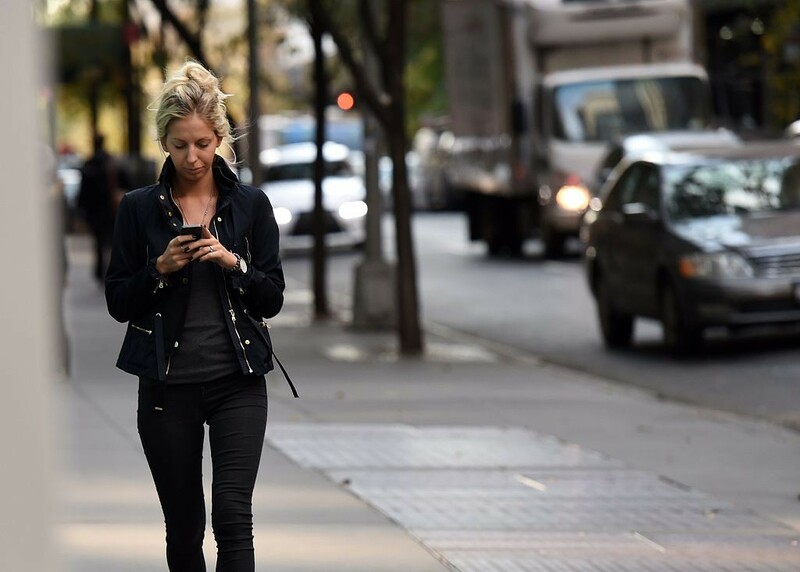 Walking down the street–a quick check of the phone to see who emailed. Watching television–why not send out a tweet, too. Sitting at dinner with family–it will take only a second to read that text. Even when we know we should resist the temptation, it’s so hard to ignore technology. We pay for it in half-completed tasks, near accidents, and disjointed conversations. Why is this? It turns out our brains are not very good at driving away distraction, and technology has only aggravated it. Guest host Derek McGinty talks to neuroscientist Dr. Adam Gazzaley and psychologist Dr. Larry Rosen about our ancient brains in a high-tech world. Copyright (c) 2016 Adam Gazzaley and Larry D. Rosen. Excerpted by permission of MIT Press. MR. DEREK MCGINTYThanks for joining us. I'm Derek McGinty, sitting in for Diane Rehm. Diane is traveling to Los Angeles to accept the International Women's Media Foundation Lifetime Achievement Award, much deserved. MR. DEREK MCGINTYWell, a few days ago I was driving down the highway, singing along with the radio when I heard this voice. It was from my significant other in the passenger seat, and it was asking me, why are you singing when I'm trying to talk to you. Uh, I got distracted? Okay, she was a bit salty at the time, but what she could not appreciate then was that this was just a minor skirmish in the ongoing war for the attention of the human mind. MR. DEREK MCGINTYHundreds of thousands of years of evolution have given us the ability to focus on the job or the conversation at hand, but now it's all being threatened by a few decades' worth of brand new technology. Sure we love our phones and our tablets, et cetera, but our brains, it turns out, have trouble tuning it all out. MR. DEREK MCGINTYWell, joining me today to talk about all this, a neuroscientist and psychologist to help explain why all this is happening and why it's likely a bad deal for all of us, including my significant other. I'm joined in studio by Dr. Adam Gazzaley, and joining me by phone from Southern California, Dr. Larry Rosen. Together they have written a book. It's called "The Distracted Mind: Ancient Brains in a High-Tech World." MR. DEREK MCGINTYI want to thank you both for being here, and I want to note that we can't wait to take your phone calls at 800-433-8850 because I guarantee you it's going to be an interesting conversation. Gentlemen, hello. MCGINTYGood to have you here. Dr. Gazzaley, I'll start with you. Getting distracted while we're trying to focus on something, in the book you call that a fundamental vulnerability of our brains. GAZZALEYYeah, what we -- what we see if we look from an evolutionary perspective on the brain, that the human brain has evolved this amazing, incredible, goal-setting ability. So we can have these goals that are time-delayed, 10 years longer into the future, and they're interwoven between multiple people and multiple goals. GAZZALEYI would say this is the pinnacle of human brain evolution. It's something that really separates us from other animals. It's allowed us to create civilization and technology and music and culture and art. But what has not evolved to the same degree is our ability to actually enact goals. In many ways it's similar to other animals, what we have in terms of cognitive control abilities, our ability to focus our attention where we want it in space and time, to hold information in mind, something we call working memory, and to multitask and task-switch. GAZZALEYWe have fundamental limitations in those abilities, and therefore when we try to enact our very high-level goals, we have what we describe as interference, essentially a conflict between what we want to do and what we're able to do. MCGINTYAnd I want to bring Dr. Rosen into this because -- so if I'm driving down the highway, and suddenly I hear my favorite song on the radio, I might not mean to turn my attention to that instead of someone who's talking to me, but somehow I may not have a choice, Dr. Rosen. DR. LARRY ROSENRight, and thank you for having me on, Derek. Yes, you may not have a choice, but even I think more serious is if you're driving down the highway, and your phone beeps and indicating some sort of an alert or a notification, perhaps a text message from your significant other, perhaps an email message, perhaps a Facebook notification, and that's even more compelling and more likely to drag your attention from the road to your mind, saying things like, ooh, I wonder who that is, I wonder what that is, and that then drives you to make the mistake of picking your phone and looking at it while you're driving at 65 miles an hour. MCGINTYNow you note there are two different kinds of interference. You have top-down and bottom-up. Now when that text message comes in on your phone, that would be part of the bottom-up interference, correct? ROSENCorrect, that is the outside stimulus driving your focus and your attention elsewhere. GAZZALEYYes, so we are -- we interact with the world to these two influences that you mention, and bottom-up is how the environment grabs your attention based on things that are very salient, very novel, and then we have this unique ability to interact with the environment based on our goals, and that's top-down. And this intersection between top-down and bottom-up basically dictates how you navigate through this complex world that we live in. GAZZALEYSo you can be, and we know we are all the time, distracted by bottom-up stimuli, but we also can be distracted internally by our own thoughts. GAZZALEYIn other words, you're trying to focus on reading a book or doing something for a loved one, but something else intrudes because you start just thinking about it. ROSENExactly, so we have this vulnerability in not just sensitivity to the environment pulling us away from what we're doing but also in sustaining our attention, especially if it might be something that is -- lasts for a long time, and it might be more boring. So this is a frequent problem, obviously, with children in school and trying to manage in that environment. MCGINTYBut the fact is it's now a frequent problem for grownups who aren't in school because you note that we were evolved in a world with a lot of distractions but maybe only a fraction of the number of distractions that have sort of come of age in this age of technology. GAZZALEYYeah, I would say that there's always been this challenge of interference. It's just how the human brain works and what the environment does is it presents these pulls. But technology, especially modern technology and information technology that we talk about a lot in the book, has really exposed us to an unprecedented amount of information and also information that doesn't just wait for you to seek it out but information that seeks you out and taps on you when it wants your attention. MCGINTYAnd why are we so anxious to access that information, Dr. Rosen? ROSENWell, it's interesting because most of the information that we're anxious to access turns out to be about communication. And I believe that what has happened is over the past decade or two, we have evolved into a system where we communicate way more online, electronically, than we do face to face. And in the beginning, electronic communication online was simply telephone, but then it evolved into email, and now it has evolved into text messages and snaps and maybe seven or eight different social media accounts, all of which we feel inside our brain that sort of top-down influence of questions like, oh, I haven't checked Facebook for a while, I better check in, or oh, I wonder if somebody liked my post on Istagram. ROSENAnd so part of what's going on is that we are pounded by these communications and these alerts both internal and external, and that's driving our behavior. MCGINTYYou know, I've got to tell you, I have been guilty of posting something on Twitter and then go back five minutes later just to see if I've gotten any retweets or likes. What is it about our brains that craves that? GAZZALEYWell in general, as we describe in the book, we're information-seeking creatures. We forage for information in the way other animals forage for food. We've essentially evolved those basic reward systems that drives an animal to eat to survive to seek out information in this very primal way. So we have that as part of our brains, of our very nature. But now with information being so accessible and also, as Larry just described, about human-to-human interaction, we have this rise of anxiety when you are missing out on something else. MCGINTYIt -- can you compare it to, for example, the human desire to eat meat or sweets, which were scarce in our earlier, you know, incarnations, but now we can get as much as we want, and we don't know how to say no? GAZZALEYYeah, I think it's very similar to that. We in the book use what's known as an optimal foraging model, which has been used to describe the behavior of how animals forage for food in very patch environments like a bear in a field or a squirrel in a tree. And we now feel that we are foraging for information in a very similar way, just grabbing but then moving on too quickly, not staying in one site long enough. MCGINTYRight, and there's plenty of it to go around, but we act like it's scarce, Dr. Rosen. ROSENWell, what's interesting is I like to describe is we're all acting a bit like squirrels on ADHD. We know that we're in a tree where there's lots of acorn, and we eat an acorn, but then we spy an acorn somewhere in another tree, and we jump over there and grab that acorn, and then we jump back and grab another one, and instead of staying and satisfying our hunger for information in our case, we keep moving on. ROSENAnd part of the problem is that it's very accessible. In front of me, while I'm talking to you, I have two screens, a phone, a tablet and a regular phone, and there's information coming in on all of them, and if I weren't looking the other way, each one of those would provide a distraction and interference in what I'm doing, which is talking to you. MCGINTYOr even more interesting than what's happening here. GAZZALEYOr more interesting, and that is what actually I was going to get to. Now it's not just the anxiety of missing out, it's also the boredom in what you're doing now. It seems that we become bored more quickly, and some of this, you know, could be related to the very rapid rewards we get when we're texting all the time and moving between information sources. Others could be how we use video games, which have very, very rapid rewards, and so it may be even more true in young people and children. GAZZALEYBut, you know, those factors of very, very high levels of accessibility and then growing anxiety and boredom and being engaged in one task keep driving this very, very rapid switching. MCGINTYDr. Adam Gazzaley is a professor of neurology, physiology and psychiatry at UC San Francisco. Dr. Larry Rosen is professor and past chair of the Psychology Department at the California State University in Dominguez Hills. And together they have written "The Distracted Mind: Ancient Brains in a High-Tech World." When I come back, we'll take your calls at 800-433-8850. You're listening to the Diane Rehm Show. MCGINTYWelcome back to "The Diane Rehm Show." I'm Derek McGinty in for Diane today. And we are talking about your distracted mind. Actually, the book is called "The Distracted Mind: Ancient Brains in a High-Tech World." Adam Gazzaley, a professor of neurology, physiology and psychiatry is here with us in the studio. Dr. Larry Rosen is on the phone with us from Southern California. He's a professor of - and past chair of the Psychology Department at California State University. Our phone number is 800-433-8850. And Terry, in Los Angeles, you're on the air. Go ahead, Terry. TERRYHi, good morning. Thanks so much for taking my phone call. I've been hearing about this topic for the last couple of years. And I wonder how it impacts the workforce. I know a very common question that I interview applicants on is their ability to multi-task. It's a question that I'm even asked when I'm being interviewed. And I really wonder how does it impact the ideal that everyone should be able to multi-task? How does it impact productivity? How does impact accuracy in our workplace? And even for schoolchildren. You know, my husband's a schoolteacher. MCGINTYYou know, Terry - go ahead. TERRYEven - my husband's a schoolteacher. And, you know, how does it impact, you know, the way students learn as well? 'Cause I think multi-tasking is something that we expect that people are able to do and do it well. MCGINTYThank you for calling, Terry. The real question, of course, is can anybody multi-task and the answer in the book, Dr. Gazzaley, says no. GAZZALEYWell, yeah, so multi-tasking is an interesting term. It's - when it's used to describe what we're trying to do, it's totally appropriate. So we try to multi-task all the time. You try to engage in a phone conversation and still get that email out or drive a car and text, hopefully not. But we know it happens and it's created a lot of problems. GAZZALEYSo the act of trying to multi-task is common. When you talk about multi-tasking and the brain itself, though, it's not really exactly what happens. So when you have two or more attention-demanding activities, your brain cannot parallel process them. So when you have one focus, let's say you're trying to have a conversation, a network in your brain of activity is activated that allows you to have this interaction. Now, if you're going to answer a text, you can't maintain that network while you do that. You have to actually deactivate it, switch networks, do the text and come back to it. MCGINTYSo our brains just aren't that powerful is what you're saying. GAZZALEYThey, I mean, they're incredibly powerful in many ways. They do things that computers still have not been able to do. You know, the rapid identification of a face you haven't seen in a long time. But one thing they're not good at is parallel processing two tasks that demand attention. ROSENWell, in the environment in the workplace, if you're task switching constantly, what typically has been shown is that you spend about three to five minutes working on a task, then you get distracted, either by an email, an instant message or again, a message inside your head saying you need to do something, then you go away for anywhere from 10 to 15, maybe 20 minutes and come back. And when you come back to the original task, as Dr. Gazzaley has said, the memory trace of what you were doing has dissipated and you have to build it back up. ROSENAnd research has shown that you can do that, but the problem is that you have to work twice as hard and you get really stressed doing it. So if you're sitting there in a workplace and you are constantly task-switching from what you're working on to your email, back to what you're working on, you're gonna spend a lot more time working very hard and getting very stressed. MCGINTYIt sounds to me as though neither task is gonna be getting done very well. ROSENWell, that's part of the problem, is you can do them both well, but it's gonna take you way more time than it would if you did one, finish it and then did the next one. MCGINTYYou know, it is interesting to me 'cause many times I have sat down to read something important, turned on some music, let's say, to be in the background. I have absolutely no idea what songs are playing because if I'm focused on what I'm reading, then I am not listening to the music and vice versa. GAZZALEYYeah, you really have to have one focused stream of attention to engage at a high level. We showed in our laboratory that even a one second interruption, or a one second distraction, we separate those. A distraction is where you're actually trying to ignore it. An interruption is where you're trying to attend to it as a secondary task. In either case, even a second will degrade the representation of what you are already engaged in and decrease your accuracy and your speed of responding to what you are already doing, compared to if you did not have that distraction or interruption. MCGINTYSo what would you say to the young people, in particular, who believe they're great multi-taskers? GAZZALEYWell, that's, you know, that's a figment of their imagination I would say. You know, they do it a lot. They wanna be great at it, but, you know, we know that the reality is that even young minds, which, you know, I'd say early 20-year-old is around as good as it gets for this type of skill, suffer a decrement, what we call a cost in performance when you divide your attention across more than one task. MCGINTYKara, in Louisville, Ky., thanks for waiting. You're on the air. KARAHi, I have a really good friend who loves to listen to information on audio. And he sort of multi-tasks, you know, whenever he's able to. And, you know, this book is right up his alley. He loves information, just like you were saying. You know, he's one of these people who can't get enough. And so I was kind of wondering at the top of the hour if this book was gonna be coming out on audio soon. But it doesn't sound like an ideal idea. Anyway, I don't know. I guess that's more of just a comment. And I can take your reaction off the air. MCGINTYWell, that's interesting though, because what you're really getting at on some level is today's attention span. I mean, he wants to be able to listen to a book on audio, because perhaps it allows him to do something else while he's taking in the information from the book. Dr. Rosen? ROSENWell, part of the problem that we see - and you can see this yourself, it's very easy. Turn on CNN, and try to first listen to Anderson Cooper and ignore the scroll at the bottom. You can listen and hear everything Anderson Cooper says and follow it. Now, just read the scroll and try listening to Anderson Cooper and you can't do it. It's impossible. You don't catch it all. So if he's listening to an audio book and doing things at the same time, something's going to suffer. Attention can only be focused in a certain place at a time and you can't split your attention in a way that effectively allows you to get all the information. MCGINTYYou know, maybe it's a stereotype, but I wonder if there's any gender differences in ability to multi-task. There is the idea out there that women might be better at it than men. GAZZALEYI think that idea is out there, but if you look at the literature it doesn't pop out as a very strong finding. We certainly have not seen it in our lab in any of the studies that we've done. MCGINTYAll right. Let's get to another phone call. Kyle, in Oxford, Ohio. KYLEI, like the first caller's husband - I'm not him, but I am a schoolteacher of 6th to 12th grade students. And I just wonder how this issue would affect younger minds and their learning and their ability to, you know, mature into adults who can maybe deal with or overcome some of these issues. MCGINTYDr. Rosen, you have a part - a chapter in your book that talks about education and the impact. ROSENRight. And part of the issue is complicated because we know that putting technology in the classroom can be a major benefit for our students, but we also know that they've grown up in an information-rich environment where they are used to task-switching all the time. So the trick then is if you're going to introduce, say, tablets in a classroom and have the students working on their tablets, you need to also make sure that they're not switching back and forth from the lesson to quick checking their email or a text or a snap or something else that has come in. ROSENThe other issue is - and we've studied students studying in their home. We've watched middle school students, high school student, college students, they all study the same way. They study for about two, three, maybe four minutes at the most, then they get distracted. Then they study for two or three minutes and then they get distracted. And this process goes on over and over and over again. And how much can you really learn in a two to three-minute little chunk? MCGINTYSo is this something new or is this how it's always been for students? Because I can recall having kind of the same experience back in college myself. And we didn't have any cellphones or computers. ROSENRight. But we had very much fewer distractions, very many fewer choices to move to. Now you've got social media accounts to check. Now you've got texts beeping at you. You've got snaps beeping at you. You've got all sorts of notifications popping up on your phone and that makes it even more difficult. So if you're going to try to focus, what it's going to do is put a lot more stress on you. And stress makes it much more difficult to learn. So the key then is creating an educational environment that does not allow distractions, but allows focus. MCGINTYThat takes it back, actually, to the first part of your book, where you talk about human beings and the battle for focus. GAZZALEYYeah, you know, I would, you know, that's, you know, a great answer. And relevant to the moment in terms of the acute impact of all the switching while you're trying to learn as a young person. I would - and another perspective is - and this one we don't know as much about, but it's a concern for a lot people - is what are the long-term effects? Not just the learning in the moment, but what does it mean for a young developing mind to always be in this type of environment where they are switching and not sustaining their attention. GAZZALEYThose of us that went to school, you know, 15, 20 years ago, growing up we were more frequently asked and in the situation where we just sustained our focus. Even it was a boring environment, we just had to learn to push through. And I would say that it's a skill. It doesn't necessarily come naturally. There's a high amount of reward in the novelty of moving from one thing to the other. GAZZALEYAnd so the concern is, if you never develop that skill, when you are - when you do need to do it, which in life we have to do it all the time, would you not really even be able to. And so that's an open-ended question, but one that concerns a lot of people. Sort of the style of always moving from one thing to another. Does it not allow the development of the skill that allows singular focused sustained attention? MCGINTYIs there something good about getting the ability to move from one thing to another? We - you just talked about the downside. Is there an upside to it? GAZZALEYWell, you know, it's fun. You know, we are essentially driven by novelty. It's one of the traits of our, you know, all of our species, that allowed us to survive, is that we seek out new environments. And so, you know, the ability to rapidly switch is, you know, is very frequently a good skill. And certainly an enjoyable state to be in. And, you know, I would say that I don't, you know, view multi-tasking as a negative, evil, bad thing. I think that it is a reasonable way to interact in your environment, sometimes. GAZZALEYI think the real question comes down to making decisions. And not being a slave to your technology. Not multi-tasking 'cause you know no other way to interact in the environment. Sometimes it's appropriate. Sometimes you really have to focus your attention on one thing. MCGINTY…that takes more attention. That's Dr. Adam Gazzaley. He is professor of neurology, physiology and psychiatry at UC-San Francisco. Director of the Gazzaley Lab, which is a cognitive neuroscience laboratory. My other guest joining me via the telephone is Dr. Larry Rosen. He's a professor and past chair of the psychology department at the California State University- Dominguez Hills. Together, they have written a book called "The Distracted Mind: Ancient Brains in a High-Tech World." Phone number here 800-433-8850. That's 800-433-8850. And you're listening to "The Diane Rehm Show." MCGINTYLet's take another phone call. Mary, in Tampa, Fla., you're on the air. Go ahead, Mary. MARYGreat subject matter. One near and dear to my heart. I try to remain unplugged from technology as much as possible. I'm 55 years old and my nickname is Techno-saurus. All my friends give me grief 'cause I'd rather talk on the phone then text. I just got my first Android about six months ago. MCGINTYHow do you like it? MARYI, yeah, horrible. I had to pay some punk kid 10 bucks to program it for me. I have no idea what I'm doing. I didn't even use it for the first six months. It was bad. MCGINTYSo did you have like a flip-phone or something before that? What did you have? MARYOh, yeah, yeah, Samsung flip-phone. And we had the little club. And every time I met a fellow user we'd take selfies - not with the phone, but guess what I used. MARYYeah. I'm an old dinosaur and I love to have face time with people. And the more distracted and unplugged they are, the more I feel rejected. I kind of take it personal. I don't feel as special. So people kind of know where I stand. I'm a big woman, so if I'm giving you the evil eye 'cause you're texting while I'm talking - I'm also known to say something like, I'll get back to you when you're done with your more important conversation. MARYYou know, embarrassing and humiliating and Jewish guilt (unintelligible) for friends and I like it. MCGINTYAll right. All right. Mary, I appreciate the call from the Mary, the Techno-saurus. What do you think, Adam? GAZZALEYWell, you know, to broaden that comment, it's really about human interaction that she's talking about. And that's what really annoys her. And she's right. I think that we are seeing an impact of being overly distracted and using our technology in this matter of multi-tasking in a way that doesn't just impact our work and our school, like we've already discussed. But impacts our relationships and the importance of looking someone in the eye and having an uninterrupted, respectful conversation. I think that, you know, we are feeling the brunt of that in, you know, with our significant others, with our families and even with our work colleagues. ROSENWell, and conversations electronically are fine. They serve a purpose. I mean, if you're trying to arrange where to meet someone, you don't necessarily need to jump on the phone. You can text them and say meet me at this location. It'll map it for you, boom, you're there. The problem is, is that when we do get together with other people face to face, we tend to then still get distracted by our phone. ROSENAnd this has gotten so bad that millennials play a game called Cellphone Stack, where if they're at a restaurant together, they will decide to all put their phones in the middle of the table upside down. And the first person who cannot stand not looking at their phone, and grabs their phone, has to pay the entire bill. MCGINTYWow. I've never heard of this. I'm obviously aged out of the cohort that would play this game. ROSENWell, and I'm an inveterate people watcher. And I watch and you can't believe the places that people grab their phone. And a lot of times I believe what they're doing is grabbing their phone so that they don't have to talk to the people around them. MCGINTYWow. Dr. Gazzaley, you point out in the book that studies have shown that there are increased level of anxiety when people can't look at their phones. GAZZALEYYeah, it doesn't even have to be your phone that's around and present at that moment that will cause anxiety. So whether it's there or not, even if it's not your phone, actually impacts anxiety. MCGINTYYeah, okay. We're talking about "The Distracted Mind: Your Ancient Brain in a High-Tech World." We're evolved to handle information and focus in a certain way, but not we're forced to handle it in a different way. And maybe we're not doing all that great. The phone number here is 800-433-8850, 800-433-8850. And if you'd like to listen in for live coverage of the final presidential debate tonight, it'll be there for you on a lot of these NPR stations, beginning at 9:00 Eastern, along with live fact-checking at NPR.org. In the meantime, now, you're listening to "The Diane Rehm Show." MCGINTYWelcome back to the Diane Rehm Show. I'm Derek McGinty, sitting in for Diane today. My guest here in the studio is Dr. Adam Gazzaley. On the phone with us is Dr. Larry D. Rosen. Together they have written "The Distracted Mind: Ancient Brains in a High-Tech World." And speaking of technology, we've been getting some emails regarding what you've written, gentlemen. MCGINTYI'll read one. It's from Erin (PH) on our website, and she says "I think we don't have as much tolerance for being bored as we used to. It's so easy now not to be bored we can't tolerate it. I've observed cell phones make meetings much worse because everybody starts checking the phone the second they get bored with what's happening in the meeting. Then when important material is missed, the presenter or speaker has to go back and repeat it." Dr. Rosen? ROSENYeah, this is a very serious issue, and we talked in the book about major game-changers, and the smart phone is, I believe, one of the most important game-changers in our life. And I think part of what has happened is over the last maybe a dozen years since smartphones came into existence, we have started acting a bit like Pavlov's dogs, meaning that we react viscerally with an alert, a notification or even a thought without really thinking about what it might do. ROSENSo in a business meeting, even if phones are not allowed, we sneak a peek at them, and that shows the power of how these devices have really literally invaded our mind and caused us to make decisions that may not be very helpful. One of the things that I have suggested in a corporate setting is that in a business meeting what you do is you do what are called tech breaks, where you literally allow everyone to look at their phone for one minute and check all their communication, turn it on silent, turn it upside-down, and then perhaps once in the middle of the meeting you give people permission to do it again so that that buildup of anxiety of needing to check in gets dissipated, and then they can pay attention to the meeting better. MCGINTYWow, I mean, it almost sounds like we're kids, and we can't be trusted to handle our phones in a proper way. GAZZALEYYeah, I'd like to comment on the caller's mention of boredom. And boredom is a really interesting phenomena. It accumulates over time, sort of in a similar way to fatigue. I think that we have grown an intolerance to boredom in a lot of ways, and our technology has given us the access to prevent boredom. But it's important to also push through boredom sometimes. Sometimes you just have to deal with it, and you'll find that it can go away. GAZZALEYIt's sort of like I think about a runner that is just so fatigued and so overwhelmed in the short distance, and they push through it, and they find that there's a reward on the other side, there's a value in just sticking with one thing beyond the point of it being uncomfortable. And so that's one lesson is that we might just have to just deal with it. Sometimes in boredom comes creativity and insights and quiet and calm that allows a different type of thinking than, you know, the constant high-stimulation environment. MCGINTYYou know, speaking of game-changers, we should -- Dr. Rosen mentioned just a few seconds ago, I was encouraged by your conclusion in the book that videogames are good for our ability to focus and get rid of distractions, so therefore those three and a half I spent on "Gears of War 4" last night were not a complete waste of time, Dr. Rosen. ROSENWell, that's Dr. Gazzaley's specialty, so I'm going to let him handle that. MCGINTY(laugh) All right, Dr. Gazzaley. GAZZALEYWell, you know, I will have to be very, very careful and tread delicately here. I wouldn't say that it's necessarily the case that all videogames are helpful. GAZZALEYThat is true. So there is a literature that is out there, a scientific literature that I think is quite strong, that shows that young people that play first-person shooter games, which are action games, usually violent content, which is a controversial aspect of it, but playing those games that demand a lot of cognitive control abilities, very rapid attention, rapid switching, working memory, improve those abilities in the young people that play them. GAZZALEYI know many people like yourself are happy to learn that data, and it is quite interesting that you can get a positive benefit from that type of interactive environment. We are now trying to build videogames from scratch in our laboratory that sort of take the best of the videogame mechanic and then use scientifically inspired algorithms to target and actually create videogames as medicine and educational tools. GAZZALEYWe actually have an FDA trial right now to see if a videogame that we created specifically to improve attention abilities can be a treatment for children with ADHD. MCGINTYIs this the "NeuroRacer" game? GAZZALEYExactly, this is what "NeuroRacer" has grown up and become. And so it's a nice, interesting flip that technology, which has aggravated the distracted mind, can also potentially be a solution, and both Larry and I are fans of technology. We're not luddites that think that -- you know, we do not want the message of this book to be to get rid of all technology. MCGINTYYou don't say go back to the flip phone? GAZZALEYNo, no, this is here to stay. We just have to learn how to manage it better. MCGINTYDanny (PH) in Saginaw, Michigan, thanks for waiting. DANNYLove the program today. I'm a musician, and I thought I was multitasking. Apparently I'm not. But I sing and play guitar at the same time, and I also kind of scan the room for what's going on, what kind of songs to play. So how am I doing all that? ROSENWell, I would argue that on many well-practiced skills, and it sounds like guitar playing and singing are well-practiced skills, you can actually multitask. Those are the few areas where you can multitask, which is why you can walk and chew gum at the same time and not trip over your feet. So he has found two skills, guitar playing and singing, that basically take less mental power and allow him to take some of those resources, some of those cognitive control resources, and switch them into scanning the audience, doing other things. ROSENA lot of gifted athletes will tell you that they really don't feel like they're thinking when they're doing a well-practiced skill, they're just doing. MCGINTYAnd that I guess is the purpose of practice, right, to build that mental pathway so you're not really thinking about doing it, you've just cultivated the ability to do it. GAZZALEYIt's true, and, you know, it comes down to semantics. So scientists in this area might consider that not multitasking because once it doesn't demand attention, it's not a task anymore. But the danger of this type of thinking is it's fine in that environment, but for example let's talk about driving for a moment, right. You get really good at it. As a matter of fact, you could drive home and not even remember doing it. MCGINTYIt happens all the time. GAZZALEYRight? It's just, it's routine, and that's true until it's not. GAZZALEYAnd so that's -- that's really where driving creates this danger is that you feel like it doesn't demand your attention because you're very good at it, and many times it doesn't. But when someone steps out in the middle of the road, and now your attention is demanded, and it's now somewhere else, and it doesn't come back fast enough, that's where you have the trouble. MCGINTYDo young people have more ability to move their attention back and forth? We were talking about multitasking, but in the book you mentioned that part of the problem is older folks have a more difficult time blocking out distraction than do the young. GAZZALEYOlder adults have a tougher time with both forms of interference. They have a harder time filtering distracting, irrelevant information that they've already made up their minds they want to ignore. Picture being in a restaurant trying to have a conversation and just having that cascade of sound around you just get in even though you want it out. GAZZALEYAnd then they also have a more difficult time when they decide to try to multitask between two events. Now mind you, young minds also are challenged, but it does get worse as we get older. This was a big aspect of the research of my own laboratory. MCGINTYLet's listen to an email. "What is the opinion of your guests on how to handle the issue of needing to multitask? Meditating has been shown to help students in the classroom." Have you guys looked into that at all? ROSENThere is some research showing that teaching young students mindful meditation skills help them be more calm in the classroom, be more focused in the classroom and learn better. There's a study I read where they taught the teachers how to teach the kids mindful meditation in kindergarten, albeit very young little kids, and every day they would do a very short mindful meditation, and the teachers would keep track of their behavior or their behavioral outbursts and found that over a very short period of time, the outbursts started to disappear, and the kids were more focused in the class. MCGINTYIs part of our issue overall that expectations have changed because of our technology? In other words, if I called you 30 years ago, the phone would just ring and ring and ring and ring, and you weren't home, and then I knew I'd have to call back later because there was no way to leave a message. I bet all you -- you'd have some 25-year-olds out there that would not recognize a busy signal if they heard it, right, because they've never heard one before. We don't expect to not be able to reach each other. GAZZALEYThere's a massive burden -- go ahead. GAZZALEYYeah, you know, despite all the things that we've been talking about, this incredible accessibility to information that makes us just constantly jump between all of these sources, there is undoubtedly a shift in the expectations and demands that we place on each other. When you text someone, if you don't hear back from them sometimes even in 10 minutes, you're like I wonder what's up, you know, what's going on here. MCGINTYAre they mad at me? GAZZALEYAre they mad at me? Is something wrong? You know, and then you text again, and it leads to these loops of anxiety. And it's not just expectations in terms of social interactions. You know, as we talk about in the book, you know, vacations have really disappeared in many ways in terms of your engagement in work. People, most people are checking their work email even when they're away from the office, even when they're on a vacation. And the expectations that people are checking in first thing in the morning, before they go to sleep, Saturday, Sunday, all the time, is a big demand and one that has, you know, sort of aggravated this problem even further. MCGINTYAre there other ramifications to this, Dr. Rosen? ROSENWell, one of the ones that I'm very concerned about is the impact that technology is having in our sleep. We are almost all using our phones right up to the minute that we try to go to sleep, and then we wonder why we have sleep problems. Well, it turns out that as the night comes and starts to get darker, as the day gets darker and starts to be dusk and night, our brain releases melatonin, which is designed to help us slowly put us into a sleepy state and get us ready to go to bed. ROSENThe problem is that the technologies that use LEDs emit light in lots of spectrums, but one of them is blue light, and blue light retards melatonin. So in particular the blue light from your smartphones held close to your face, which we all do, retards melatonin. So we're all using our phones right up to the minute we go to sleep, we're having difficulty sleeping, and worse yet we've done some studies on this with millennials, 75 percent of millennials sleep with their phone next to their bed, under their pillow, in their hand. ROSENAnd half of them get up at least once in the middle of the night to check something other than the time. And we wonder why they have difficulty getting back to sleep, and we wonder why they're sleeping or accumulating a massive sleep debt, and that's the kind of debt, by the way, that must be repaid, otherwise your brain does not function as well. MCGINTYDr. Larry Rosen is on the phone with us. Here in the studio is Dr. Adam Gazzaley. They have written the book "The Distracted Mind: Ancient Brains in a High-Tech World." I'm Derek McGinty, and you're listening to the Diane Rehm Show. Gentlemen, I'm wondering if you, either of you, have changed your habits because of what you found out in the research for this book, Dr. Gazzaley. GAZZALEYI have. I now learn to revalue the act of sustained, focused, singular attention. I don't do it all the time, but I make that decision probably at least once a day and sometimes for hours. And I've retrained myself to be able to hold my attention and take breaks when I need them and not necessarily tech breaks. So I now devote some time to multitasking. When I'm doing something that doesn't require high quality and doesn't have a time stamp on it that needs to be done rapidly, low-level stuff, I'll jump between a lot of tasks because it's fun, and sometimes it's the only thing you can do to get through some of these tasks. GAZZALEYBut when I really have to focus, I now shut off my email, I quit it, I don't just minimize it. I'll go down to one screen, often I work with two screens, I'll close my door. Sometimes I'll even turn my phone to airplane mode, and I will just focus on one activity. ROSENTwo things. One, I agree absolutely with Dr. Gazzaley, I do the same thing. When I have to focus on something, I turn off my three other screens. I don't minimize my email off, I turn my phone on silent, and I focus. I do give myself breaks every 15 to 30 minutes to check in because the anxiety starts rising up, and I feel like I'm not focusing as much. The other thing I do is that an hour before I go to bed, I now put my phone on silent, upside-down, next to the bed and use it only as an alarm clock. I do not look it up. ROSENThe third thing, by the way, that I started to do, which I think is interesting, is when a question arises about a fact, instead of going, oh, I'll just check with Siri, or I'll just look it up on Google, I try to spend five to 10 minutes thinking of what the answer might be, exercising my brain rather than letting the technology be my external memory. MCGINTYIs there anything we can do to get folks to maybe adopt some of your strategies because it is so addictive to use the technology? GAZZALEYI think like everything else, it's practice. It doesn't come easy. Nothing in life that's valuable really does. And so if you, you know, if you read the book, and you understand, and we talk about metacognition in the book, it takes some appreciation for why our brains are vulnerable to this and what the negative impact is across so many aspects of our life, as we've been discussing. GAZZALEYAnd then once you internalize that, and you're, like, oh, I see it in myself now, this is important to me, then we outline some steps that you can take, sometimes using technology, to decrease accessibility of technology, especially when you want to focus, and also how to manage that anxiety and accumulating burden of being bored. MCGINTYDr. Rosen, you'll get the final word on this one. ROSENAnd I think that boredom is an interesting topic, and I'm glad that Adam brought that up at the end. I think we have to practice being bored. I think we have to allow ourselves to have time to just free think, let our mind wander, let ourselves daydream because that's when we get our best ideas and our most creative ideas. You know how they always say you get your best ideas in the shower, well, that's because you're not thinking of work in the shower. You're just taking a shower, and your brain flips into a mode that allows it to become much more creative. And I think in the long run that's going to help us a lot. MCGINTYWow, I think all are good ideas. I think it's tough to not go straight to your Google when you want to know something, (laugh) especially if you've got speech recognition on your phone. I like to just ask Google, but your point is well-taken. Thinking is good exercise just -- even independent of whether you can come up with your own answer. Thank you, Dr. Rosen, I appreciate that. I want thank both of you, Larry D. Rosen and Adam Gazzaley. Their book is called "The Distracted Mind: Ancient Brains in a High-Tech World." It's been a very great conversation, appreciate all the phone calls, and you've been listening to the Diane Rehm Show. Thanks for joining us.